I grew up eating bisquick pancakes. You know, the pre-measured mixes where you just add milk, eggs and oil. 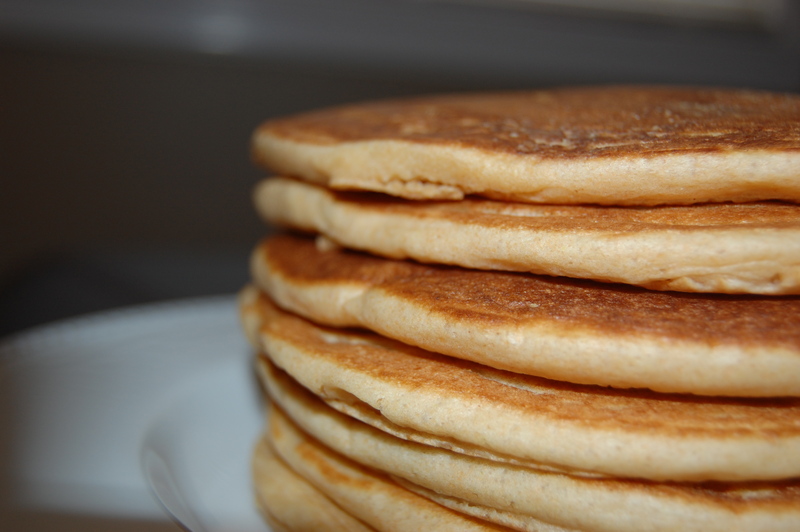 They always did the trick and were easy enough to make, so I never thought about going out and finding a pancake recipe that was made from scratch. Well, that all changed a couple months ago when I discovered my Grandma’s Buttermilk Pancake recipe. I whipped up a batch of these homemade pancakes and quickly realized that taking a little extra time to measure out my own ingredients, and add a few extra special ones, made a world of difference. These pancakes were light, airy and sweet. I may never go back to the box! Mix the dry ingredients together in a large bowl. Add the remaining buttermilk, butter or oil and eggs and beat well until combined. Fry in a well oiled pan. This recipe works well cut in half for a smaller group. Haute Homemake Tip: If you don’t have buttermilk on hand, don’t worry! Simply take one cup of regular milk and add 1 tablespoon of white vinegar or lemon juice. Let stand 5 minutes and use as much as the recipe calls for. I was having a pancakes discussion earlier today and I was basically laughed of the room when I confessed that (gasp!) I can’t make pancakes worth a darn. It certainly didn’t help when I admitted to using (double-gasp) spray-on pancakes in a can. (I tried to defend myself and the Batter Blaster in my fridge by say “but they’re organic!” but by then it was too late). So I guess I’ll do what I always do: blame the husband and kids for my laziness. So wait the Batter Blaster pancakes are organic AND instant? Not thinking lazy, thinking awesome. These will be tried. And soon.